Always FREE SHIPPING over $50 -after discounts applied! You have just encountered the world’s largest collection of themed and guided journals and memory books on the market. 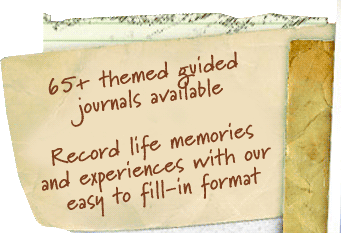 We make it easy and fun to record your thoughts, life experiences, and precious memories with over 65 themed journal titles with guided pages that feature our trademark easy to fill-in format. Each keepsake journal has prompted pages to engage the writer and capture the things that really matter. We offer personalized journals for truly one of a kind gifts! We offer custom journals with a low minimum of only 25 journals. The “Write-it-Down!” journal series is printed in the USA on acid-free recycled paper using soy based ink. The journals have a durable hard cover design and handcrafted look. They are available in two cover styles – Natural Kraft and the Color Collection. Be sure to check out our NEW Write to Remember interview style journals for Mom, Dad, Grandma, Grandpa that are great keepsake memory books. We also offer a great line of themed organizational JUMBO notepads. Our poem to the left, printed in our journals, pretty much sums it up!